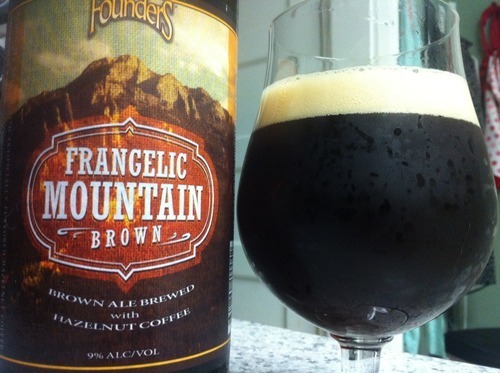 Founders Frangelic Mountain Brown | Drink. Blog. Repeat. Oh, Founders. How I love you so. Not only are your year-round and seasonal beers great, but your Backstage Series really shows just how awesome you really are. First, there was Blushing Monk, the awesome Belgian ale brewed with raspberries. Then, one of the holiest of holies, Canadian Breakfast Stout, a chocolate and coffee stout which hung out in bourbon barrels used to age maple syrup. (Side note: One of the best beers I’ve ever had. Duh.) That was followed with Curmudgeon’s Better Half, a take on your old ale brewed with molasses, aged on oak and then aged again for nearly a year in bourbon barrels also used to age maple syrup. All phenomenal, and I’m happy to welcome Frangelic Mountain Brown to the club. The beer is, surprisingly, the brewery’s first brown ale. It’s brewed with hazelnut coffee – which I friggin’ love – and then bottled for your drinking pleasure. No fancy aging, no bourbon barrels, just a straight-up brown ale with hazelnut awesomeness. So, why is it part of such an illustrious collection of beers? Because it’s so damn good. The pour is – surprisingly enough – brown, but with hits of amber around the curves of the glass. Two fingers of a creamy off-white head tops it and sticks around. Very nice lacing and alcohol legs as well. I absolutely love anything with hazelnuts in it, so the nose on this was heavenly. There’s a huge creamy hazelnut coffee right off the bat, along with a big chocolate note. It’s a very creamy smelling. The taste is absolutely positively delicious. It’s a little light on the front of the tongue and has a lighter body, but the flavor explodes on the back. It doesn’t play around. It’s just straight hazelnuts and coffee. There’s a great roasted taste and a really smooth nuttiness from the hazelnut. It all settles into a surprisingly creamy chocolate taste. Just a slight hint of the alcohol, too. While this is considered the least favorite of the series among a lot of folks, that’s not necessarily a bad thing. It’s like receiving an A on a paper when you’ve been scoring an A+ on the three you’ve written before it. It doesn’t mean you’re bad or a disappointment at all, it just means you’re slightly less awesome than you are on a usual basis. Still, the creaminess of the hazelnuts and the roasted qualities of the coffee make this one just as superb as its predecessors. Pingback: Lazy Magnolia Southern Pecan | Drink. Blog. Repeat.